Although Hakuba’s biggest attraction is it’s skiing, after a few days on the slopes, skiing takes quite a physical toll on your body. When you’re feeling a bit stiff and sore, you’ll be searching for something else to do, and while sitting by the fire sipping sake is certainly a favourite past time of visitors to Hakuba, there are also plenty of opportunities for sightseeing nearby. A great way to experience some of Japan’s ancient history and unique culture, Hakuba attractions range from nature and wildlife attractions to historical, architectural, religious and hands-on attractions. One of the better known Hakuba attractions are the amusing snow moneys of Jigokudani Monkey Park. Located just over an hour and a half’s drive from Hakuba, the monkey park is the perfect day trip and offers visitors the chance to witness 200 ‘wild’ snow monkeys as they warm themselves in the hot springs. Be sure to have your camera ready for the cute and playful antics of these fascinating monkeys. Used to tourists, the monkeys allow you to get quite close to them as they bathe. The Nagano Zenkoji Temple is also located nearby and is often combined as part of a day trip to see the snow monkeys. A designated national treasure, the temple has a long history including bringing the first Buddha image to Japan during the 7th century. Be sure to wear warm socks as you are required to remove your shoes before entering the temple. Tours are available under the temple which include the fascinating experience of walking through the small tunnels in complete darkness. Around the temple, the local streets provide some insight into traditional Japanese architecture and way of life. 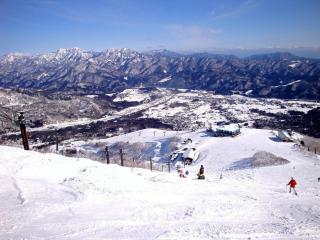 Another popular Hakuba attraction is the appropriately nicknamed ‘crow castle’. Known for its black exterior, Matsumoto Castle is Japan’s oldest five tiered donjon castle and was built roughly 400 years ago. Nearby, the Daio wasabi farm is a fun way to taste wasabi in many different forms, including the unique wasabi ice cream. There are plenty of other tourist experiences to be had in Hakuba including samurai evenings, sake tastings, soba noodle making, origami folding, tea ceremonies and traditional kimono dressings.